Cornsweet illusion. The left part of the picture seems to be darker then the right one. In fact they have the same brightness. The Cornsweet illusion, also known as Craik-O'Brien-Cornsweet illusion or Craik-Cornsweet illusion, is an optical illusion where the gradient within a central line or section creates the impression that one side of the image is in fact darker than the other. In reality, both sections are the same. The Cornsweet illusion, as well as numerous other visual and perceptual illusions, provide a valuable way to investigate how the eye and brain process visual information. Equally, they are used by artists for visual effect, entertaining and satisfying the endless fascination human beings have with novelty and creativity. The same image as above, but the edge in the middle is hidden. The left and right part of the image now look the same color. The Cornsweet illusion, also known as Craik-O'Brien-Cornsweet illusion or Craik-Cornsweet illusion, is an optical illusion that was described in detail by Tom Cornsweet in the late 1960s, and published in 1970 in 'Visual Perception'. Craik and O'Brien had made earlier observations in a similar vein, and thus the illusion is often referred to as the Craik-O'Brien-Cornsweet illusion. When looking at the classic Cornsweet illusion, two squares of differing contrast appear to be separated by a thin band of gradient. In reality, the two squares are exactly the same level of contrast. In some examples, the illusion is so convincing that the only way it can be believed is to cover over everything but the two identical colors, thus proving that they are indeed the same. This phenomenon is similar to the familiar phenomenon of simultaneous contrast and Mach bands, but differs from it in two important respects. In Mach bands the effect is seen only on areas that are close to the intensity gradient. In the Cornsweet illusion, a very small area (the central "edge") affects the perception of entire large areas, portions of which are distant from the edge. 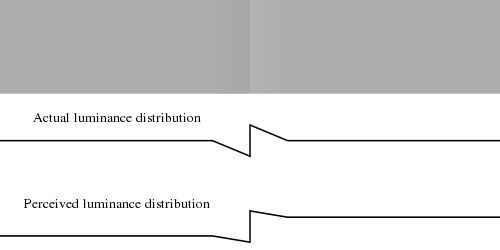 In the Cornsweet illusion, the region adjacent to the light part of the edge appears lighter, and the region adjacent to the dark part of the edge appears darker, just the opposite of the usual contrast effects. The actual distribution of luminance in the picture, and the typical perception of luminance. The Cornsweet illusion is an example of the way the brain uses the edges of shapes to impart information to the surrounding areas, and takes place because of the way nerve impulses travel through the visual cortex. The retina interprets what it sees using certain luminance profiles. The Cornsweet image is processed with nearly identical codes, which the cortex then integrates and arrives at the same perceptual result. In other words, the brain is used to seeing things a certain way, and often interprets information within those parameters. The Cornsweet illusion has applications in graphic design, where it can be used to create interesting visual effects. Awareness of the Cornsweet illusion is also useful in areas like radiology; without awareness of the Cornsweet illusion, technicians can potentially misread areas of x-ray images. ↑ K.J.W. Craik. The Nature of Psychology. Cambridge, UK: Cambridge University Press, 1966. ↑ V. O’Brien V. "Contrast by contour-enhancement." American Journal of Psychology, 1959, 72:299–300. ↑ Michael Bach. "Craik-O;Brien-Cornsweet Illusion" June 2002. Optical Illusions and Visual Phenomena. Retrieved October 30, 2007. ↑ Ian Maddison. "The Physiology of the Silhouette Sign in the Chest X-ray" November 1994. Retrieved October 30, 2007. Craik, K.J.W. 1966. The Nature of Psychology. Cambridge, UK: Cambridge University Press. O’Brien V. 1959. "Contrast by contour-enhancement." American Journal of Psychology, 72:299–300. Purves D., A. Shimpi, and R.B. Lotto. 1999. An empirical explanation of the Cornsweet effect J. Neurosci. 19:8542-8551. Retrieved October 30, 2007. Purves D, and R.B. Lotto. 2003. Why We See What We Do: An Empirical Theory of Vision. Sunderland, MA: Sinauer Associates. Purves D, and R.B. Lotto. 2004. The Cornsweet effect. Encyclopedia of Neuroscience, 3rd edition. Elsevier Science Publishing Co.
Craik-O'Brien-Cornsweet Illusion by Michael Bach. This page was last modified on 24 March 2017, at 19:48.